Want to generate some 8-bit Nintendo style sounds? Maybe you need sound effects for an iPhone game you’re working on, a song you’re making, or you just want to have some good old 8-bit nostalgia. Cfxr, which is short for… well I have no idea, is a fun app that makes and endless amount of 8 bit sounds instantly. You can completely adjust sounds, or just click the ‘random’ button and it will make and play a randomly generated sound effect for you. As you can see in the screenshot below, there are a few pre-determined styles of sounds that fit your classic 8-bit gaming needs: Pickup/coin, Laser/shoot, Explosion, Powerup, hit/hurt, Jump, Blip/select, and Random. You can then use the sliders to adjust all aspects of the sound effects and then export the files in either 16 or 8 bit audio as a wav file so you can use them later. You can grab the Mac version of Cfxr here, it’s a free download. 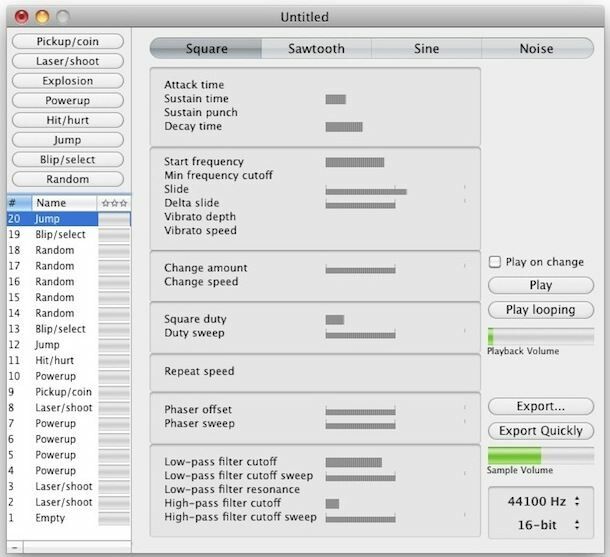 If you want to generate some Nintendo style sound effects in Windows, or you don’t want to grab the Mac download, there’s a Flash version available here that has basically the same interface and functionality, and also allows you to export your sound effects as .wav files.